Makenna and Aubrey Nielsen keep a watchful eye as Aaron Belina pilots his boat to the boat loading ramp. Long before I became a Blair resident, I was impressed by the beauty of the Blair Parks. As a kid, I remember riding with my family into Blair and seeing the rose garden and the log cabin at Rhoades Park and the big trees along the entry way to town. Years later my wife and I drove my mother-in-law to Blair for an elder hostel at Dana College. 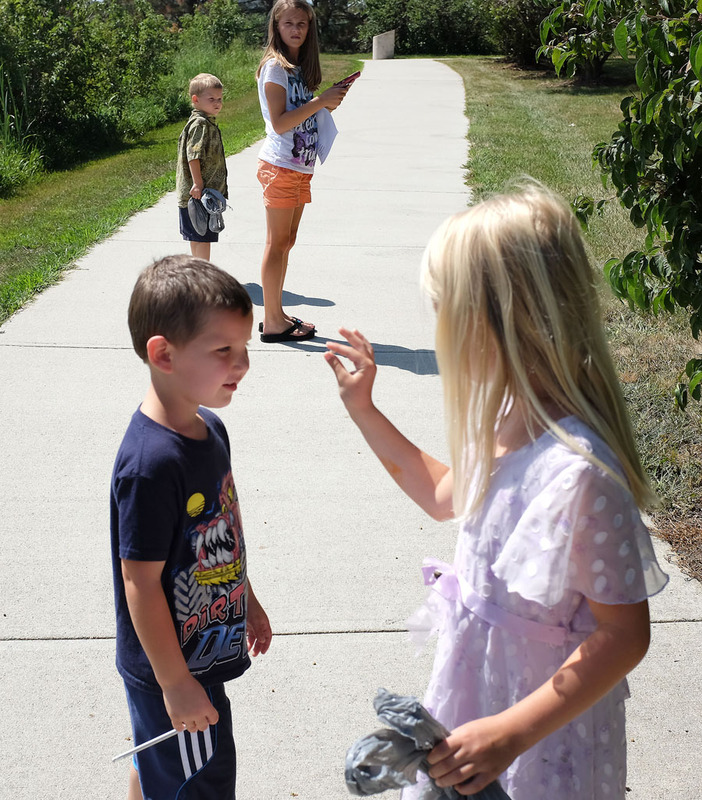 It was a very hot day, but we picnicked in the shade at Ralph Steyer Park and let the kids play. I remember the picturesque city pool and park, and thinking that this would be a nice place to live. When I picture Blair, I picture trees. The Blair Community Arboretum consisting of several of the Blair Parks, the Arbor Park School grounds and Dana College campus is a part of the Nebraska Statewide Arboretum. According to the State Arboretum website, only Arbor Lodge in Nebraska City has more tree species than the Blair Arboretum. The city is blessed with ten lovely parks that comprise over 150 acres and a growing trail system. As the city grows, the park system needs to continue grow with it. For this reason, the city has hired Big Muddy Workshop to study the existing park infrastructure, gather concerns suggestions from residents and other stakeholders, and prepare a master park plan. As a frequent park user I definitely see the need for a master plan to map the future of the park and trail system. I love to walk and photograph at Black Elk-Neihardt Park. I swim at the city pool in Steyer Park through-out the summer from early June until the closing day in early August. I think the Depot in the Park is a first rate facility for concerts, picnics and events.To add to my personal history and experience, I decided to make a Sunday tour to see how the parks are used and by whom. In the morning I stopped by Bob Hardy RV Park. This facility located just west of Highway 30 and tucked between the railroad track and Nebraska Street is easily overlooked and ignored by many residents. Three of the five or six units in the park on Sunday belonged to three couples from Columbus who enjoy traveling together and staying in city parks across the state. They picked Blair because of the close proximity to Omaha where they went shopping and attended a bridal shower. They like to camp in city parks because they are usually less crowded. Tim Holbauer and Barry Baldwin said the fee of $15 per night with electricity and water is reasonable, and the park was one of the nicer city campgrounds in the state. They like the cement pads underneath the picnic tables, and refuse containers conveniently located near the pads. They described the restroom and bath house facilities as clean and adequate. They would like to see the RV pads a little wider and a little deeper. They did not particularly care for the trains that pass by near the campground. They also said that the facility would probably get more use if it were listed in the Nebraska RV directories. As I drove into Black Elk-Neihardt Park the parking lot was nearly full and music and voices could be heard coming from the picnic shelter. Christ Lutheran Church was holding Rally Sunday which serves as a kick off for the new Sunday School season. A nice breeze kept the congregation comfortable through the service a potluck luncheon and a scavenger hunt for the kids and pot luck dinner followed. Later I drove through Ralph Steyer Park. While the temperature was in the mid 90’s, the pool, of course, is empty and the park deserted on this hot afternoon. I will be back to the park in a few weeks to watch as the leaves change color. In January and February I will wade in knee-deep snow to photograph kids on sleds navigate the Steyer Park slopes. In the late afternoon I headed to Optimist Park and watched as boats passed by on the river and where Aaron Belina was preparing to pilot his boat onto a boat trailer. The Belina and Nielsen families were coming in after spending the afternoon pleasure boating and playing on a sand bar upriver. Aaron Belina said his family takes the boat out a couple times each month throughout the summer. He described the improvements at Optimist Park as awesome. He looks foreword to better road access and would like to see a nicer courtesy dock. Belina described the activity on at the marina about normal for a Sunday. He said that not just Blair and Washington County boaters make use of the park. He he often sees Douglas County plates on trailers in the busy parking lot. 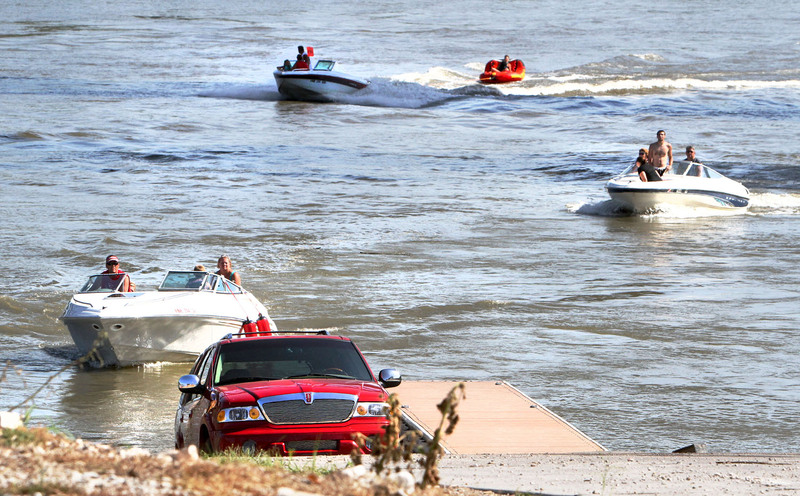 Optimist Park is the only public access between Tekamah and Dodge Park on the Nebraska side of the river. The Belina family who lives near Styer park and Nielsen family from Kennard spend time at the city pool in the summer and would like to see improvements to that facility. What they would most like to see is a splash pad that would be open throughout the summer and not close in early August. Brian Nielsen said his son Makenna plays baseball and the boys would love to be able to enjoy cooling off at a splash pad after playing baseball as they do when they play at a park in Omaha. The second of three public hearings is scheduled for Wednesday, September 3. All are invited and encouraged to stop by the City Council chamber to learn more about the plan and share their concerns and ideas. As Park board member Steve Tonn stated at last month’s input session, citizen involvement is key to the process. 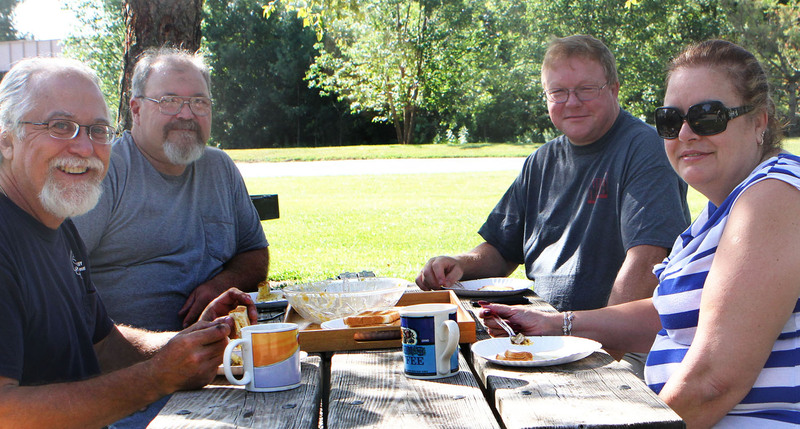 Barry Baldwin, Dan Griffith, Tim Halbauer and Tammy Baldwin share breakfast at Bob Hardy RV park on Sunday morning. 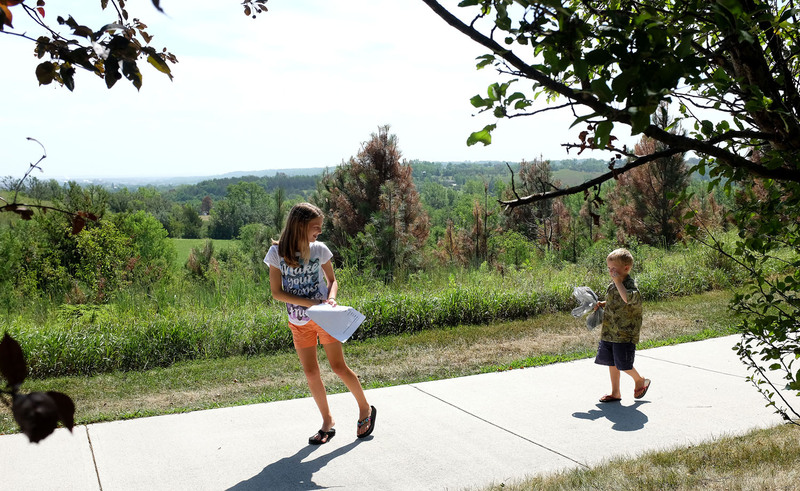 Tamry Putnam and Paul Owen look for colored leaves and grass during a scavenger hunt at Black Elk-Neihardt park. 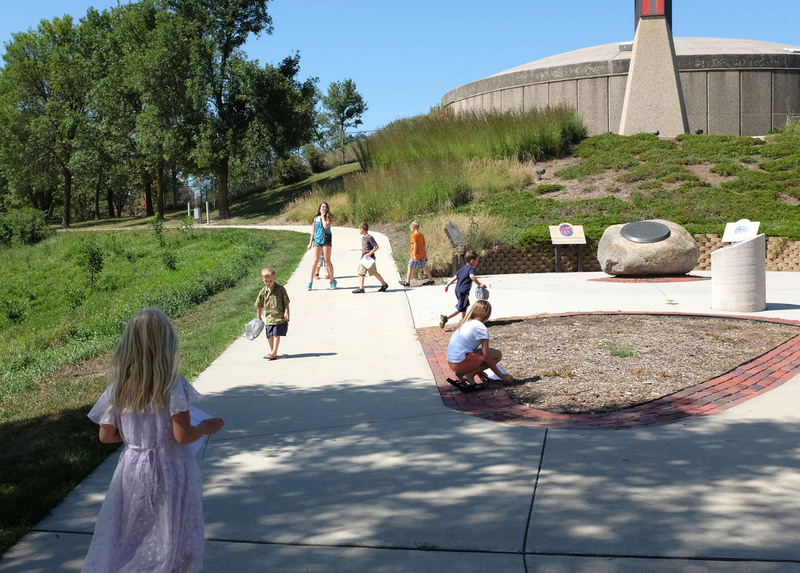 Following the Rally Sunday service held in the picnic shelter at Black Elk-Neihardt park, the kids kept busy with a scavenger hunt while the adults prepared fotrthe pot luck luncheon.